Hotel accommodation. Clubhouse with bar, restaurant. Pro shop. Golf Practice area. La Finca, which opened in 2002, is a young golf course owned by QUARA Group (owners of several golf courses). It is located in the town of Algorfa in Alicante Province. The 18 hole course was designed by the prestigious designer Pepe Gancedo. Although not an easy course it offers generous fairways and spectacular greens. The situation and layout of the course (situated at the foot of the Escotera Mountains) between citrus fields, in a natural environment, with superb views of the “Vega Baja" could hardly be more Mediterranean. 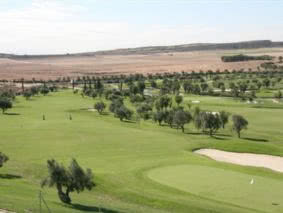 Designed to host top golf tournaments, La Finca offers the greatest variety in green sizes on the entire Costa Blanca. In addition to the variety in green size and the abundance of bunkers, lakes offer beauty and additional challenge, making La Finca not only many golfers’ favourite course, but also home to a variety of migrating water birds. The many olive and palm trees complete the picture. A great course, where you will definitely enjoy a good day’s golf. A good all round course for the low to high handicaper. Loved this course. Best of the 4 in the area we played. New clubhouse under construction, which looks like it will be really good when finished. Will definitely be going back. La Finca was promised as one of the best courses in the area and they were right. The course is set in a wide valley and from up on high, the course is a spectacular view with arid mountains providing the backdrop. The first hole is a par 5 and begins with a tee 30ft above the fairway and this sets the tone for the day. The course meanders through well maintained fairways, across water hazards with palms trees and olive trees lining the route. Some may consider the course hilly in places but most inclines are gradual, so you never feel out of breath. The greens are superb. Flat and true and quick! Besides the island greens, the two tiered greens and the 'well' greens, the biggest surprise of the day was to find ourselves putting on a 'square' green, yes, a perfectly square green - brilliant!! The clubhouse and shop aren't much to discuss and as this is on the main hotel complex, its probably not important anyway. However, what I can say is that without exception, all the staff in this hotel were friendly, helpful, you were always met with a smile but we must thank 'Experience Manager' Raquel for this, she was excellent - not just a pretty face - as were her colleagues on reception. My only complaint...what a shame the marshall on the course (playing himself on the day) wasn't so polite.... he can only be described as an arrogant arse - perhaps Raquel can give him some lessons on how to treat the paying public!! All in all, a fantastic resort, modern, clean and one that I would highly recommend! It's beautiful. It's a little forgiving. It's fun to play, and has some nice holes. All wrapped up in lovely surroundings. It's nice, play it! Say no more!